I know that’s a mouthful but trust me, they’re so easy. 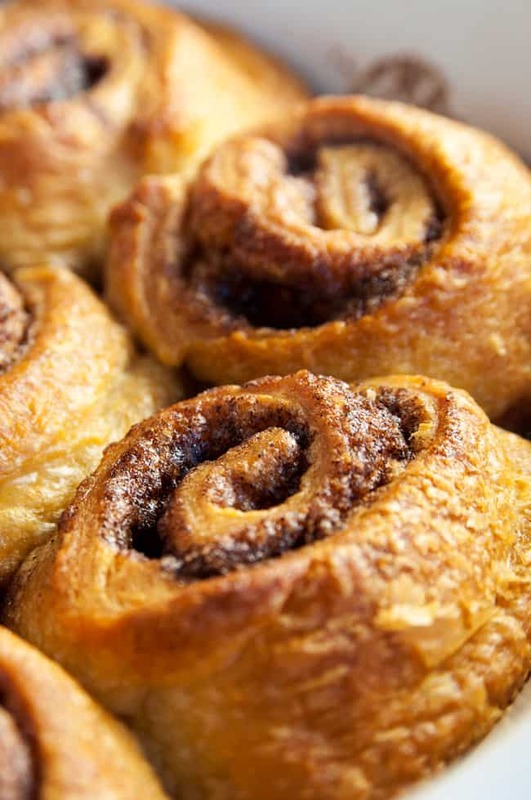 You’ll have these cinnamon rolls done from prep to oven in less than 25 minutes. The secret ingredients in these new favorite Christmas desserts are the crescent rolls. A few months ago I was inspired by Stacie’s Mini Rum Butter Cinnamon Rolls and created my own Pumpkin Pie Cinnamon Rolls over on The Bewitchin’ Kitchen. There are so many things you can do with crescent rolls. I’ve made hand pies, turnovers, and cinnamon rolls. All you have to do is simply pinch together the seams, lay out the melted butter and pack on the cinnamon mixture. (PS – the leftover cinnamon mixture makes a really nice hand scrub after, like this Chocolate Sugar Scrub). Seriously, can it get any easier than that? 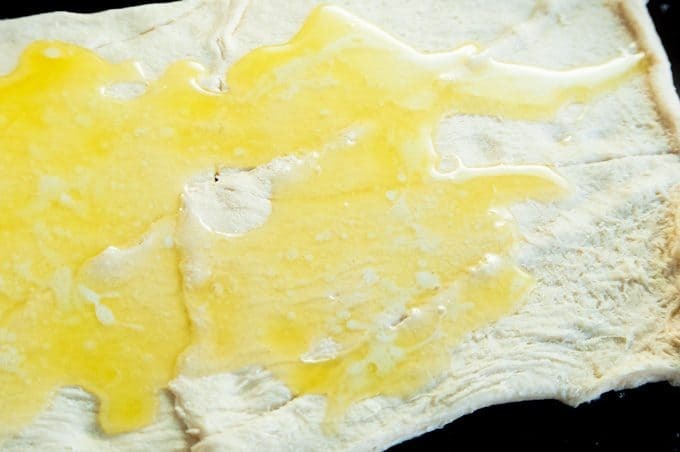 Not only is this recipe easy, but it’s fast. It’s ready in under 25 minutes, so it’s perfect for surprise guests “popping in” around the holidays. The gingerbread cream cheese frosting is my recipe for Gingerbread Dessert Dip (from The Bewitchin’ Kitchen) but cut in half. I knew it would work beautifully for these cinnamon rolls and I was right. These cinnamon rolls are so easy to put together. Crescent rolls, butter, sugar, brown sugar, and cinnamon is all the makes up the rolls themselves and the gingerbread cream cheese frosting recipe is a creamy, holiday infused topping. If you want to add a little extra gingerbread to the recipe, you can sprinkle crushed gingerbread over top of the frosting. What is your favorite way to enjoy cinnamon rolls? This may become your new favorite Christmas dessert! The best part is that they are SO EASY to make and always a hit. Pop open the can of crescent rolls and roll out flat. Pinch the seams together to make one large rectangle. Pour the melted butter over the dough, and then sprinkle the sugars and cinnamon. Rub it all together. Roll the cinnamon rolls and cut into 9, 1-inch pieces. Spray a pie dish with non-stick spray and lay the 9 pieces. While baking mix together the gingerbread frosting. 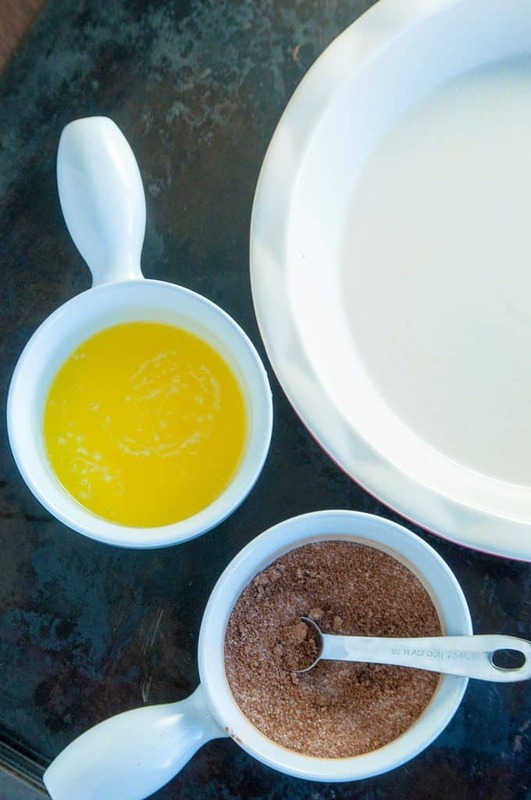 Mix all the ingredients together in a medium mixing bowl. When the cinnamon rolls come out of the oven, let cool for five minutes. Pour the frosting over the rolls. Randa is the founder of The Bewitchin' Kitchen where she believes lives are brought together at the kitchen table. She blogs about her loves: amazing food, inspiring travel, and her the light of her life, her son. Join #CanadasGarage Winter Prep Twitter Party on November 2nd! These look so good! I am going to make them as soon as I get all the ingredients. I love cinnamon rolls, and these look amazingly yummy! 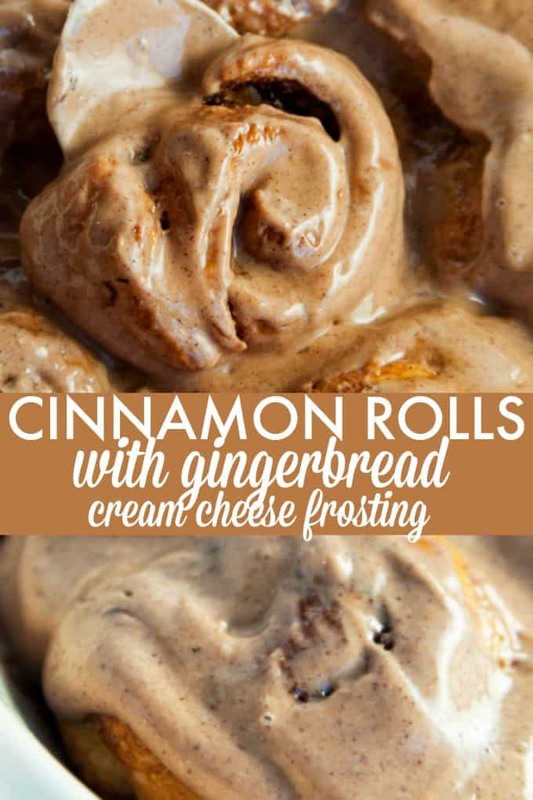 The Cinnamon Rolls with Gingerbread Cream Cheese Frosting looks so delicious! I want to make this for Thanksgiving and have as a dessert for family and friends. We would love it! This is a perfect treat on a cold morning. 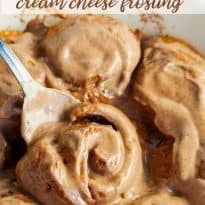 I love the gingerbread cream cheese frosting!! That sounds so amazing and these look so easy. Perfect for Christmas morning! They’re a great idea for Christmas morning because they’re so easy! How stinking smart are these?! Using crescent rolls to make them is genius. I love easy breakfast ideas. Thanks! They’re so easy too! I’ve done a few like this now. They look delicious – must try this recipe. I usually just make traditional cinnamon buns with brown sugar and cinnamon. Oh wow! These sound like heaven rolled into a perfect bun. These look so delicious that I can practically smell them cooking! Totally doable with the canned rolls, too. Pinned! 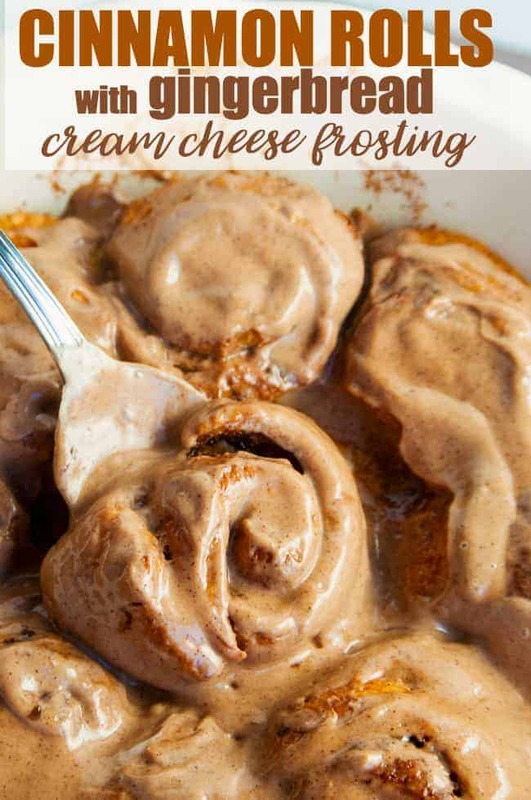 I have made cinnamon rolls loads of time using crescent rolls and we just love them… but the addition of gingerbread cream cheese frosting?! That is just brilliant!! Pinned. Thank you so much for pinning 🙂 Have a great weekend! this looks absolutely amazing. i need to have one! 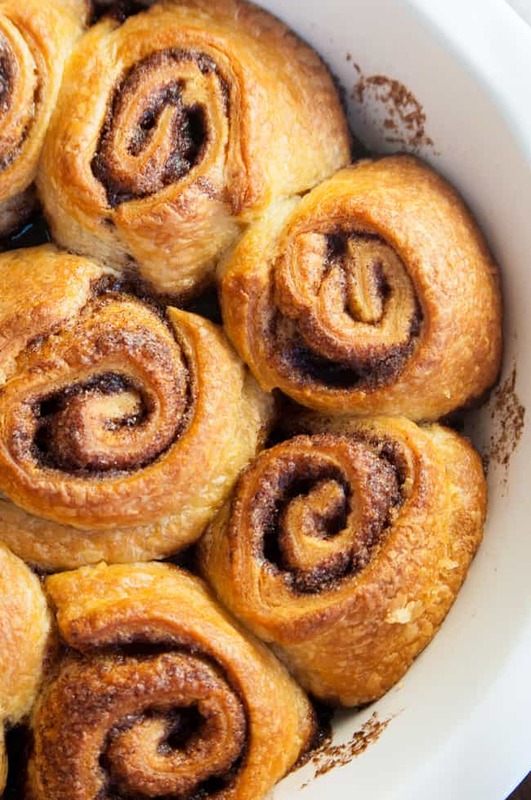 I can’t wait to make a pan of these fabulous rolls! Hope you have a great week and thanks so much for sharing with Full Plate Thursday. How decadent and yummy. A perfect dish for the holidays using gingerbread. Thanks for sharing at DI&DI. This recipe looks amazing! 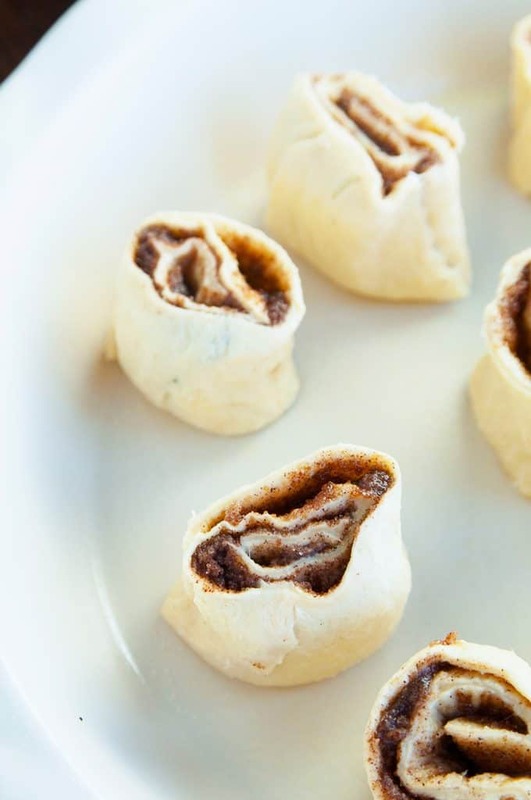 What a creative idea using crescent dough! Visiting from the blog hop. Check out my fantastic Lemon Zucchini Coconut bread later if you are in the baking mood! i enjoy my Cinnamon Rolls when they have cooled down a little from being baked in the oven. They are really delicious with icing. Thank you for this easy and tasty recipe.